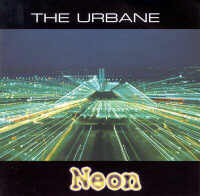 The Urbane are a Reading based band - handy for me these days - formed by John Mitchell of Arena and John Wetton band fame. John is much more than just a guitarist though as on the Urbane's debut album 'Neon' he wrote or co-wrote all the tracks as well as playing guitar and keyboards, singing, arranging the strings and producing, engineering and mixing. A busy and talented fellow. The Urbane actually predates both John's time with John Wetton and Arena as an initial line-up formed in 1994, known as ‘Fake Smile’, for a studio based project. As a two guitar four-piece the band recorded an EP and gigged around SE England before John began working with Australian soap opera star Nick Friedman in his band ‘Lurch’. Despite a large tour Friedman folded the band and returned to the southern hemisphere while John returned to an altered 'Fake Smile' which contained a reworked line-up which retained John's friend and studio assistant Martin Raggett and added drummer Paul 'Scooby' Cooper. The initial ten track demo the band recorded actually formed the basis of 'Neon' but not before John was asked to join Arena in 1997. After recording the 'Cry' EP, the live 'Welcome to the Stage and his first studio album, 'The Visitor' in 1998 with Arena 1999 saw 'Neon' completed and released on Arena's label, Verglas. Since then John has been busy with Arena and Wetton as well as running his own recording studio, Outhouse Studio. Band and solo gigs continued, mainly in the Reading area, though higher profile support slots are becoming a fixture. PAddy Darlington has been drafted in to add some live keyboards to fill out the bands sond. In mid 2002 he agreed to be part of the proposed John Young Band and The Urbane are due to support the first JYB gig in Rotherham at the end of October 2002. This page is Copyright © Doug Anderson 2000 - 2002. Created: 7 Jul 2001. Last updated: 27 September, 2002.